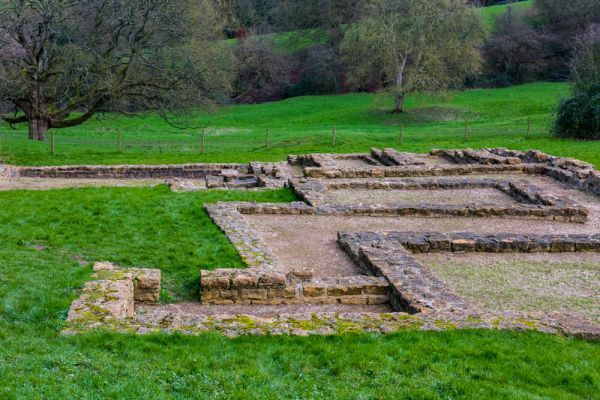 The remains of a large 3rd-century Roman villa stand in a magnificent countryside setting. The range of buildings is extensive, with a bathhouse complex and a water shrine. The villa is built around three sides of a large courtyard and overlooks a rural valley. The remains of Roman mosaics were found when the site was excavated, and these can be viewed on special open days throughout the year. 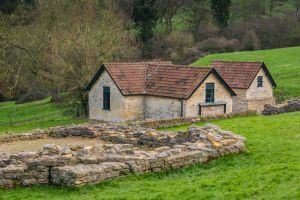 Great Witcombe villa was a large country estate built around AD 250 and abandoned sometime in the 5th century. 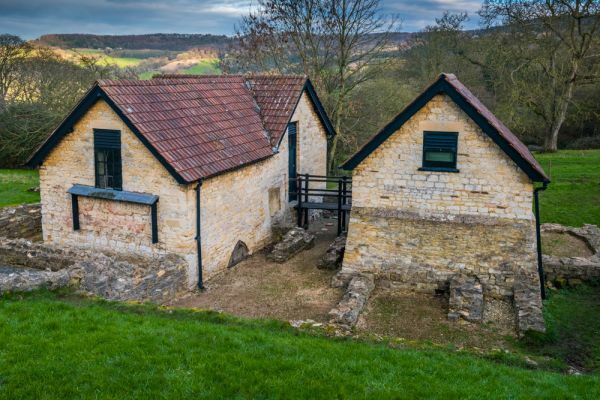 The site was discovered in 1818 and subsequent investigation during the 19th and 20th centuries revealed that the villa had two bath suites, with a collonaded gallery and porticoed entrance. 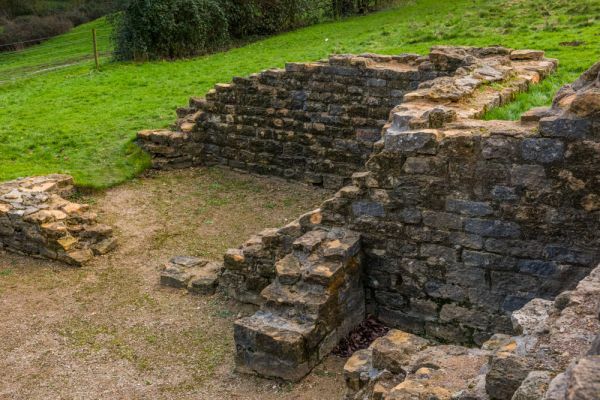 It was possibly built for the descendants of a Roman army veteran after the establishment of Gloucester as a Roman colonia, or regional capital. 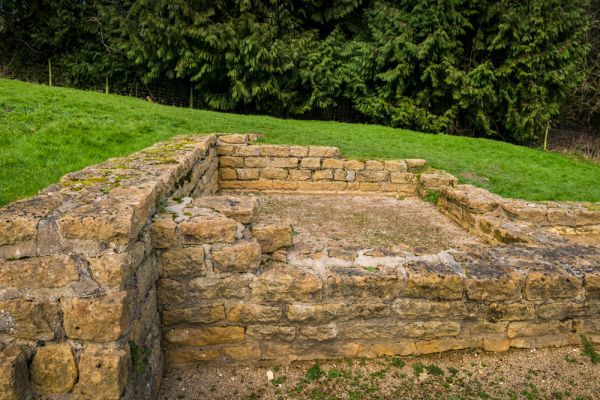 The villa may have been constructed atop an existing Iron Age building. The villa probably owes its existence to the growth of Glevum (Gloucester) and the presence of a series of springs on the slopes of Birdlip Hill. The new tribal centre and the rich farmland of the Cotswolds made the area a popular area. Good access to Gloucester and Cirencester made Great Witcombe a desirable place to live. 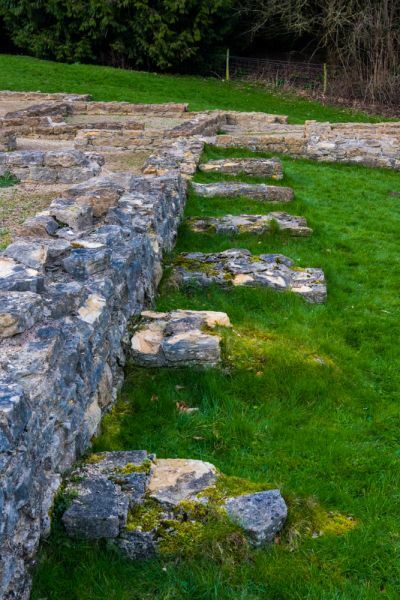 The presence of springs may have caused problems; the use of buttresses on the downhill side of the house suggests that the foundations slipped and had to be shored up. The villa was built on several terraces, and made of local limestone, with white marble used for quoins. There were 2 large wings with a courtyard. 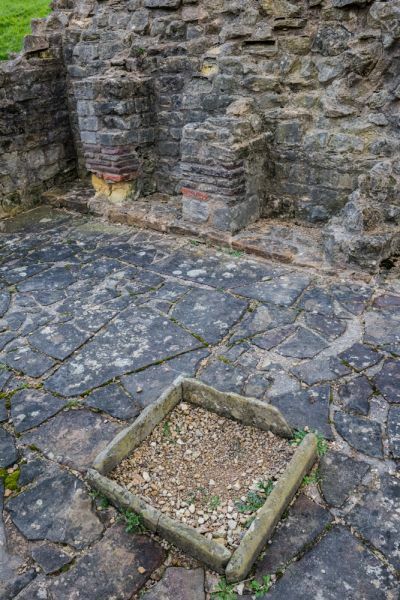 The second phase of construction saw an extension to the bath complex, set below the courtyard and protected by a cross-wall. A large structure like a barn was added to the house, also at a lower level. This might suggest that the buildings were used by a cult worshipping water spirits. Finds from excavations in 1938 include brooches, knives, plaster, pottery, and glass. In addition, a corn drying kiln was revealed, and a mithraeum, or temple. The villa is signposted off the A46 Stroud road and the minor road to Great Witcombe. The signposted route leads you into Great Witcombe park, down a winding lane that terminates in a small parking area. From there a tarmac road leads 300m to the villa site, on the eastern slope of a hill looking over the Witcombe reservoir and the Cotswold escarpment at Birdlip. The views are exceptional, even by Cotswold standards. The villa is laid out on a level terrace, sheltered to the west by Cooper's Hill and the north by a belt of trees. The location is simply stunning. The villa stretches north to south, with the family house at the northern end of the site, linked by a long gallery to the leisure complex at the southern end. The baths and exercise area is just as large as the house itself, emphasising the importance of the baths to Roman lifestyle. At the centre of the site, between the house and baths, is the octagonal dining area. You can easily make out the statue niche on one side of the dining area. There are two buildings at the lower part of the baths complex. 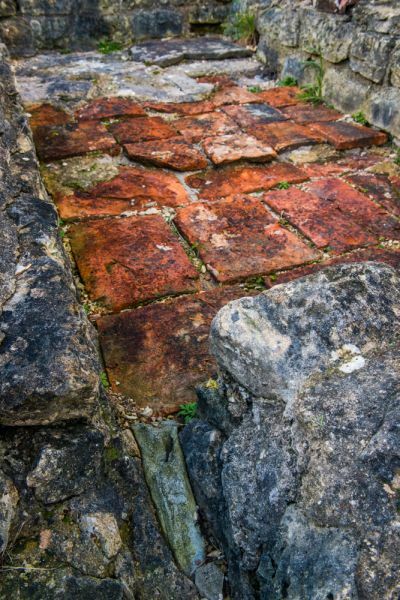 These protect Roman mosaics uncovered during mosaics. English Heritage, for whatever reason, did not provide viewing windows in these buildings, so you cannot catch even a glimpse of the mosaics. The English Heritage website no longer makes any mention of special opening days to view the Great Witcombe mosaics. It seems a great shame that if the mosaics are not regularly open to visitors they cannot even be seen by visitors through windows in the buildings that protect them. We are left to simply guess what they look like. 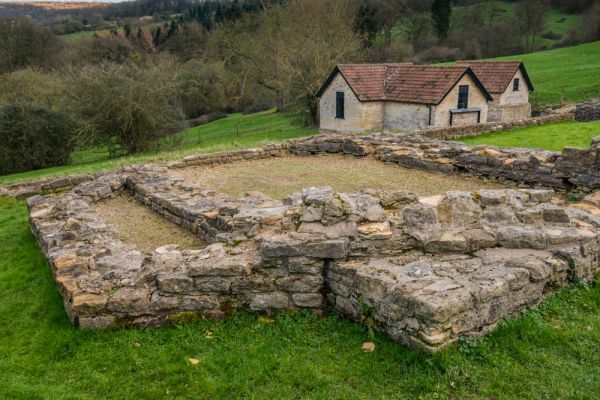 Great Witcombe villa is one of the most beautifully situated Roman sites in Britain. The valley setting is simply outstanding, and it is easy to imagine why the villa owners chose to build here. It is well worth taking the time to visit. Location: 5 miles south east of Gloucester on a minor road south of Little Witcombe village. Open access site. Free Parking 300m from the site.